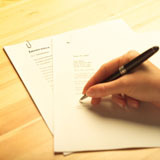 Your cover letter is your first chance to make a good impression. "You never get a second chance to make a good first impression." The Internet has attributed this well-known adage to Will Rogers, Mark Twain, and Oscar Wilde as well as various historic advertising campaigns—including that of Head and Shoulders. While we may never know who actually authored this bit of wit, one thing is certain: it is decidedly true when you’re searching for a job. If you’re a job seeker on the hunt for your next hospitality job position, your cover letter is your first chance to make a good impression—so make sure it rocks rather than flops. How can you do this? Consider the following tips. 1. Submit a matched pair. Your cover letter should look as though it belongs with your resume. This requires exercising consistency in design. Utilize the same font style, font size, margins, and spacing. If you’re submitting hard copies to a hotel or hospitalilty hiring manager, output them on the same paper using the same printer. This creates a professional, packaged appearance that shows you’ve put some effort into presentation. 2. Use the hiring manager’s name. You only have a few moments to establish a personal connection and using the hiring manager’s name is the easiest way to do so. If the content of the job posting doesn’t include a contact, take the time to find out who will read your cover letter first. It may be as easy as calling the main reception and making an inquiry. If you cannot uncover this information, do not use “To whom it may concern” or “Dear hiring manager.” It’s better to address no one at all. 3. Mention a mutual contact. If a fellow hotel worker or someone who works at the company referred you, mention their name in your opening paragraph. This illustrates that you already have a relationship of sorts with the employer, and it is one of the fastest ways to distinguish your cover letter from all the rest. 4. Get to the point. 5. Don’t repeat your resume. Don't repeat everything you’ve said in your resume—just do it in paragraph form. A rocking cover letter—one that captures attention and increases your chances of landing an interview—illustrates your qualifications differently than a resume. Find ways to show your personality and tell a story while elaborating on accomplishments. For example, you might mention the event that originally sparked your interest in pursuing a career in the Food & Beverage Industry and how it led you to where you are today. According to the Society for Human Resource Management, hiring managers spend less than 60 seconds reviewing each cover letter they receive. Use that time to make a good first impression with your cover letter and they could become the most important 60 seconds of your career.